There’s been talk for a while now indicating that the folks at Apple are gearing up to unveil a revamped iPhone (5S), as well as a low-cost version (5C), on September 10. What we haven’t heard so much about is when the Cupertino-based company might release its eagerly anticipated all-new mobile operating system, iOS 7. 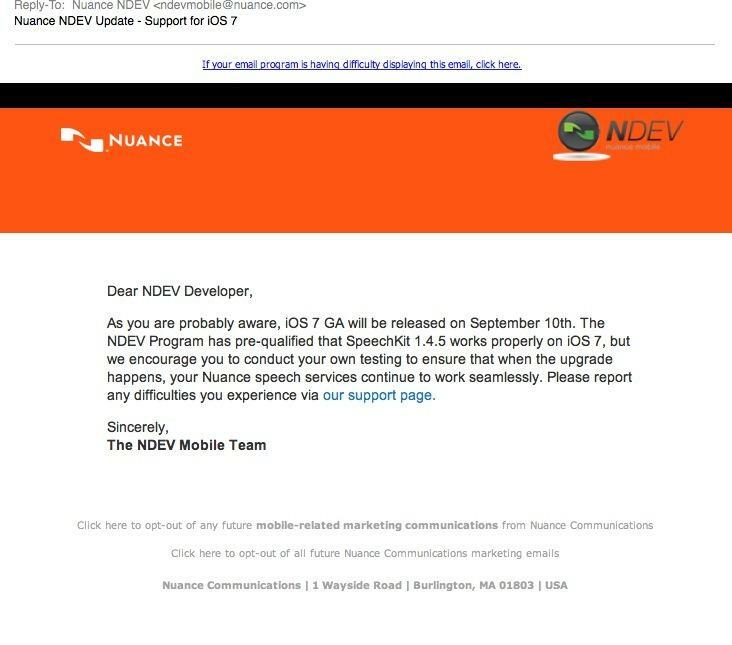 However, a marketing email sent to developers from Nuance, the company behind Siri, suggests the new OS will also be rolled out on September 10, prior to the launch of the iPhone 5S and 5C – unless Apple has plans to launch the phones on the same day they show them off, something it’s never done before with its handset. Last year iOS 6 was released to the public on September 19, one week after it unveiled its iPhone 5 handset. Of course, it’s hard to believe anyone outside Apple’s inner circle has been informed of the precise date of the release without any public announcement having been made – the “as you are probably aware” part may suggest the company is just going by all the recent reports that’ve been circulating suggesting a September 10 Apple event. Whatever the case, users keen to put the new OS through its paces are certain to have the opportunity in the coming weeks. There’s more interest than usual in Apple’s new mobile operating system as it represents the biggest change since the iPhone launched in 2007. Redesigned from the ground up, the system gets a completely new look with plenty of new features. However, design chief Jony Ive and his team have apparently been careful to ensure it remains familiar to existing iDevice owners and simple to use. Some older Apple devices won’t be able to load up the new OS. If you have an iPhone, iPad or iPod Touch and want to know on which side of the divide you fall, click here.